It is the fruit of the Vanilla Aromatica, a creeping shrub of the Orchis tribe, growing on the mountains of Mexico and Peru, and South America. This fruit has a strong, peculiar, and agreeable odour, a warns aromatic, and sweetish taste; it appears to contain benzoic acid. 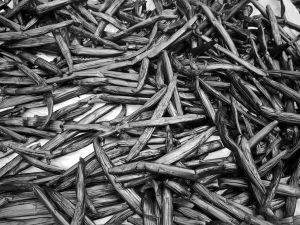 As sold in the shops, vanilla is a shrivelled pod of the kidney-bean shape, 6 inches long, wrinkled, feels oily, and adhesive to the fingers, has a balsamic odour, a taste like prunes, with the flavour of burning pantiles. It is used by perfumers, confectioners, and distillers, and to give a balsamic flavour to confectionary; and it is employed in small quantities as an adjunct to chocolate, to which it gives sweet�ness and a delicate flavour. It is valuable to the perfumer, the odour of the substance being one of the most exquisite imaginable. Medicinally vanillait assists the digestion, and restores the impaired gastric forces; it gives tone to the stomach, strengthens the intestines and heart, gives vigour and activity to the brain and the mental powers; therefore it is valuable to dyspeptic and persons nervously low.